Welcome to Oahu Catamarans Waikiki Sailing- Oahu’s favorite sailing tours. Oahu’s exclusive sailing catamaran tours operating the beautiful Kahala Kai custom sailing catamaran of Oahu. Nestled between downtown Honolulu and Waikiki; just minutes away, Oahu Catamaran tours is your one and only local sailing charter adventure in Waikiki devoted to sailing enthusiasts who want absolute comfort while sailing Oahu and the shore of famous Waikiki. We do Waikiki snorkeling tours, Oahu sailing charters , fun day sailing, Waikiki sunset sailing, Honolulu sailing in the evening, corporate outings, Oahu dinner cruises, Oahu memories, funerals and of course Oahu weddings. We can do it all as we have the expertise to help you plan the coolest sailing Oahu adventure in Waikiki. 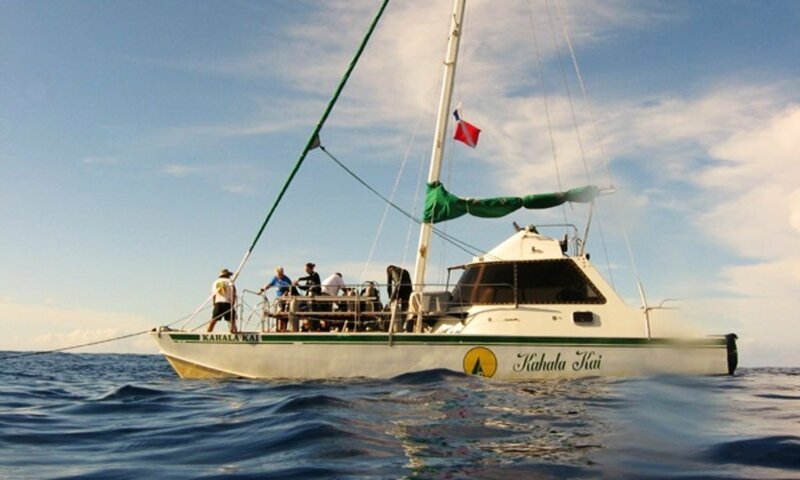 Oahu Catamaran sailing and snorkeling tour sails Oahu daily offering the best in picturesque views of downtown Honolulu and right up to the front base of Diamond Head – Oahu’s most iconic extinct volcano. Smooth sailing Oahu is the name of the game, and you can rest assure the Kahala Kai sailing catamaran in Waikiki can can handle these Hawaiian waters. The Kahala Kai is not an imported sailing catamaran like our competition, she was built exclusively for the waters of Oahu and being a true catamaran the level of comfort is impeccable. Sea sickness almost becomes a thing of the past once you set sail on this Waikiki sailing catamaran with Oahu Catamarans. Come join Oahu Catamarans Waikiki sailing for a unique Honolulu sailing, Waikiki sailing or of course Oahu sailing experience. We specialize is custom snorkeling and sailing tours and in most cases make a schedule that will work for your vacation. Contact Oahu Catamarans Tours to see what we can do for you. With years in the business we can help you decide on what is the best for your private catamaran Oahu sailing adventure or snorkeling adventure in Waikiki. Waikiki Sailing is custom and very laid back. Unlike our competitors’ tours we do not have to adhere to other priorities making your sailing tour in Oahu the very best ocean adventure among sailing tours in Oahu. Customer service is guaranteed. With picture prefect views of the majestic Diamond Head you will see Oahu like no other. City views of Honolulu are prefect at night. Friday Night Fireworks Tour; absolutely the best view in Oahu. Staying in Waikiki couldn’t even compete on this one. Honolulu Snorkeling, Sailing and More! Snorkeling and sailing Oahu tours are fun for everyone. With plenty of room for 30 riders the Kahala Kai catamaran is what you are looking for. 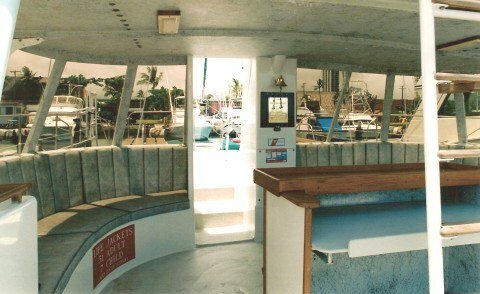 Departing Kewalo Boat Basin we will take you on a scenic catamaran sail down the coast of Oahu’s southern shores. Swimming and snorkeling with turtles and fish are just minutes away with our Oahu Catamarans Snorkeling and Sailing tours. With snorkeling gear provided let us show you the coolest Oahu snorkeling locations. Not too deep and safe for children Oahu snorkeling locations have clear warm inviting waters with our easy step down ladder you can slide into a dream come true. Private Hawaii sailing charters and private Oahu boat charters. First and foremost we use the Kahala Kai for our sailing and snorkeling trips Oahu. The main deck is perfect for gear set-ups, easy movement and entry into the water. Snorkelers and Oahu scuba divers alike routinely praise the ease and comfort of this Oahu sailing catamaran. The main deck has 2 beautiful benches that double for scuba divers with gear on and/or a comfortable place to sit back and enjoy the sunset with our padded seat covers. Come join Oahu Catamarans Snorkeling and Sailing Tours of Waikiki located near Honolulu. With daily departure, snorkeling tours, sailing adventures, memorial services, private tours, weddings at sea and much more let Oahu Catamarans Snorleing and Sailing Tours of Waikiki be your number one family tour in Oahu.